Cakes by Chloe LLC is an award-winning cake design studio that creates stylized bespoke cakes for all occasions and is owned by professionally trained pastry chef, Chloe Lee. Our creations have been featured in Weddings Magazine, Martha Stewart Weddings, The Knot, Wedding Paper Divas, Borrowed & Blue, The Wedding Chicks, Carolina Bride, Style Me Pretty, Southern Weddings, Carats & Cake, Bridal Guide Magazine, Trendy Bride Magazine to name a few. We combine professional pastry techniques with innovative masterful design and each cake is customized to your preferences. Our cakes are always made to order, from scratch, using only the best and freshest ingredients including European chocolate and cocoa powder, Plugra butter, and fresh cream. Because we emphasize natural flavors, no artificial preservatives or mixes are ever used and our cakes are never frozen at any point. Our goal is to exceed your expectations by challenging the ordinary and to provide you with a spectacular, hand-crafted cake that is as delectable as it is beautiful. 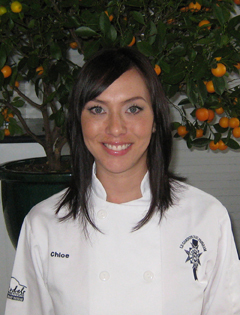 Chloe Lee has been baking and catering desserts for parties for years even before she had formal training. After receiving a Bachelor’s degree in Psychology with a minor in Sociology and working in the pharmaceutical industry, she decided it was time to embrace her true passion: cakes! In order to do this, she attended Le Cordon Bleu College of Culinary Arts in Scottsdale, Arizona. In 2006 she graduated with a Diplôme D’Art Pâtisserie. She performed her externship and gained valuable experience with an award winning cake boutique in Phoenix. Chloe has since relocated back to North Carolina to pursue her career as a cake designer. She finds inspiration in everything around her including nature; the extensive traveling she has been fortunate to have done (throughout Europe, Asia, Central America, South Africa and North America); her father, an international sculptor; and her mother, a designer whose garden has been featured in a national magazine. Chloe draws on her formal training, continuing design education, and natural creative talent to provide her clients with extraordinary one of a kind creations.